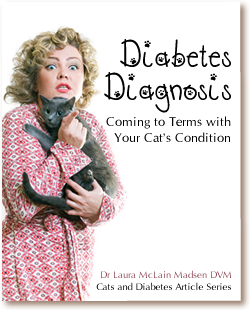 Your veterinarian has just given your cat a diabetes diagnosis. You probably feel overwhelmed, confused and nervous. You might be afraid for your cat’s health and happiness, and afraid that he will hate you for giving him injections. You might also be worried about the impact on your wallet from the prescriptions. Relax. Many people have been in the same situation, and they survived. In many cases, owners of cats with diabetes actually end up having a stronger bond with their beloved pet because of the close relationship that develops through feeding, injections and monitoring. Your cat won’t hate you; he will still love you and will be healthier for the treatment. Your cat’s diabetes diagnosis is not a death sentence! Many cats with diabetes live long and happy lives. The first step in coming to terms with the diabetes diagnosis is to find a reliable source of information. Congratulations! You’ve already accomplished that by finding this website. Next, read as much information as you can find. Read accounts of how other people and their pets developed a routine for treatment. Ask questions, and don’t feel silly for asking. Treatment of cat diabetes may require a lifestyle change for you and your kitty. Perhaps you’ll need to transition him from being free-fed to being meal-fed, or transition him from kibble to canned food. And you’ll most likely need to learn how to give insulin injections. But take a deep breath. Your cat’s diabetes probably took at least a few weeks to develop, so you can safely take a few weeks to gradually transition your cat’s lifestyle and figure out the details of treatment. You do need to be aware that a cat with diabetes will generally need life-long treatment, and will need a consistent daily schedule. It’s possible your cat might go into remission and not require insulin injections, but he’ll still need special feeding and monitoring. You can rest assured that in many cases, diabetes does not shorten your cat’s lifespan. Your furry friend can still be a beloved family member for many years after the initial diagnosis. Usually, learning how to give insulin injections is the scariest part of learning about cats and diabetes. Have your veterinarian or their nurse show you how to draw up the insulin into the syringe. Practice until you feel comfortable. Don’t worry that your vet will be annoyed by you practicing; she wants you to succeed. Also, ask your veterinarian to shave a few patches of fur on your cat. Your cat will have a funny-looking hairdo until the fur regrows, but being able to see the skin makes it easier to give the injection when you’re just learning. You can practice giving injections to your cat with sterile saline. 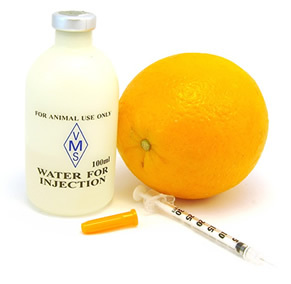 Another option is to practice giving the injections into an orange. If you are worried about the financial impact of treatment, discuss your concerns with your veterinarian. She may be able to recommend less-expensive over-the-counter foods, or prescribe a cheaper type of insulin. Also, ask about learning how to perform monitoring and test for diabetes at home; this may save money in the long run. You can do this! Your cat will thank you for it.